October Newsletter is out! Spooky Halloween treats and fun! Exciting Pokémon news, activities, and more! 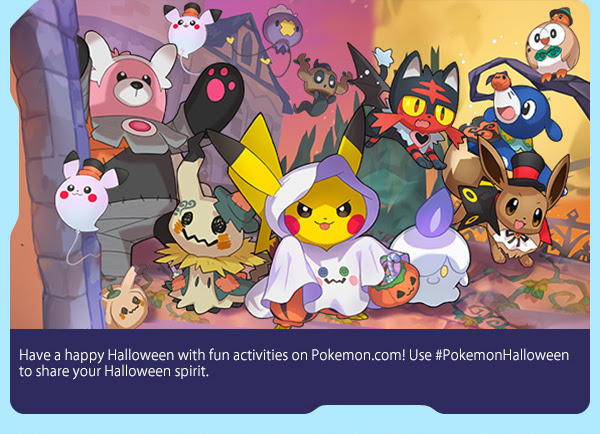 This month is full of spooky Pokémon fun! Ghost-type Pokémon and extra treats in Pokémon GO, amazing Halloween fan art creations, Pokémon Ultra Sun & Pokémon Ultra Moon news, and much more! Be sure to check out this month's newsletter for more exciting Pokémon news, updates, and activities! 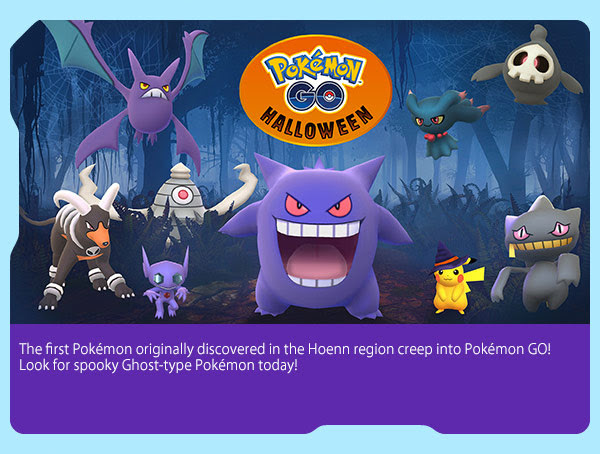 Pokémon GO trainers can enjoy a few treats this Halloween! Pokémon Halloween fan art! Check out all the amazing art work fans have created and see how you can submit your own work! Beware... some of these Pokémon creations are very spooky! Watch the trailer for Pokémon the Movie: I Choose You! For Pokémon Sun or Pokémon Moon trainers, be sure to pick up a code at your local GameStop for a Mythical Marshadow! Pokémon Sun or Pokémon Moon trainers can claim a code at their local GameStop for a Shiny Silvally! 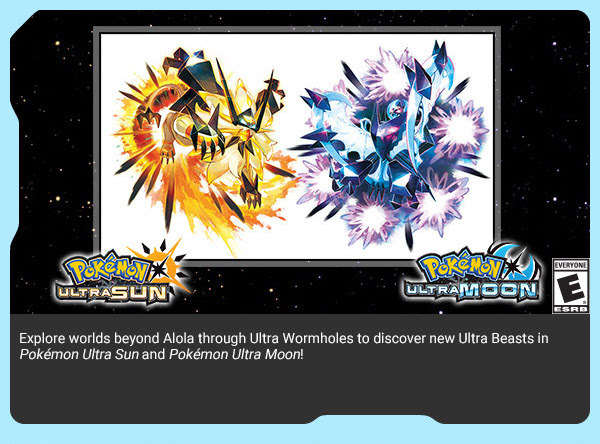 Check out all the exciting details for Pokémon Ultra Sun and Pokémon Ultra Moon! Pokkén Tournament DX is now available for Nintendo Switch! Pokémon Europe International Championships are right around the corner! Be sure to save the date on your calendar and don't miss any of the action live streamed on Twitch! 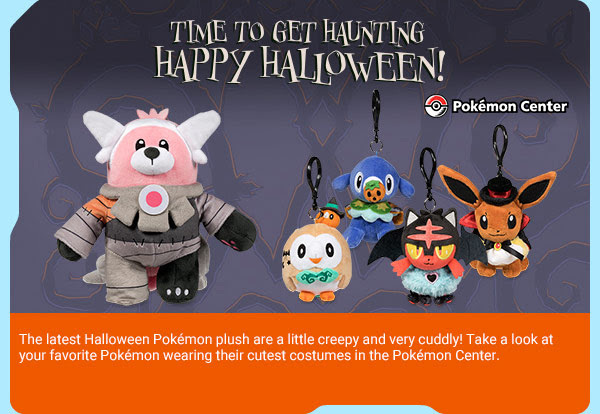 The Pokémon Center has new Halloween goodies! QR Rental Teams allow trainers to try out teams played by the Pokémon World Championship video game finalists in Pokémon Sun or Pokémon Moon. Check out the link above for more details about this exciting new feature! Exclusive Pikachu ornaments are available at participating Toys "R" Us locations. 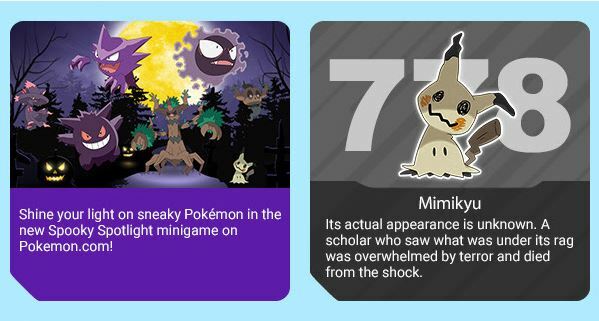 See if you can top the high score in the spooky Pokémon minigame, Spooky Spotlight! Remember, you have to sign up for the monthly newsletter before you can start receiving these awesome extras. Scroll all the way to the bottom to make sure that your Email Preferences have a checkmark next to "I would like to receive marketing email messages, including information about future online games, from The Pokémon Company International." Ensure your email address is correct and up to date. Also, add pokemon@email.pokemon.com to your address book so that your newsletter doesn’t get caught in your spam filter. Then, look forward to receiving the Pokémon Trainer Club newsletter in your email throughout the year to stay in-the-know about everything going on in the Pokémon universe! If you experience any issues receiving your letter, please visit the Pokémon Support Website and let us know. Be sure to subscribe to recieve the newsletter including unique codes via email. If you're already signed up, don't forget to check out www.pokemon.com for exciting Pokémon news, updates, games, and more!